NOTE: This Miscellaneous Ramblings column originally appeared on MacOpinion on 1999.03.05. It is republished here by permission of the author and MacOpinion. IBM recently released their new ThinkPad 770z, which is a major competitor for Apple's current and future G3 Series professional PowerBooks. Personally, I don't find the Wintel full-sized notebooks nearly as fetching as various "thin" PC models like the Sony Vaio and the Mitsubishi Pedion. However, the new ThinkPad is a pretty nice piece, despite its PC architecture and Windoze. Comment: the numbers speak for themselves here. TP770Z: 128 MB Std./ 320 MB Max. Comment: Apple should have made 64 MB standard on the G3 Series, which they will finally do with Lombard. 32 MB is almost unusable with these machines. ThinkPad has a very respectable 128 MB standard, but then Windows Apps. gobble up more RAM than Mac ones. Lombard's 512 MB RAM maximum (2x 256 MB DIMMs) will put the Mac way in the lead here. Comment: ThinkPad wins this one for high-res fans. Boy, Times 12 is gonna require a magnifying glass on those screens. The PowerBook wins handily in the color support department. Comment: Apple presumably figures that with USB connectivity built into Lombard, only one PC Card slot is necessary. Some may disagree. Comment: Apple is fixing the mirror only restriction on Lombard. Comment: Apple may go with a standard HD size of a little as 4 GB, but will offer up to 12+ GB optionally. Many notebook users really don't need monster HD's. Apple is wise to give them a choice. Comment: How ThinkPad users abide that horrible little TrackPoint nubbin is a mystery to me. G3 Series II: 7.7 lbs.. Comment: The ThinkPad is heaviest, and Lombard will have a substantial advantage in this category. Comment: Pretty much a wash here except that the ThinkPad has built-in DVD support. All three machines have 56k modems, 16 bit Stereo sound in/out, IrDA support, and LiIon batteries. Apple is really not competitive with IBM, Dell, and others in the warranty category. They wouldn't get away with it if Macs weren't so dependable. Conclusion: While the ThinkPad 770z at $4,764.09 (366/13.7/no DVD) has some nice features and standard DVD support, the G3 Series II at $3,699.00 (300/14.1/no DVD) is still an all-round nicer, higher-performance package and better value, and Lombard will raise the bar even higher. PowerBook G3, 233 MHz, 32 MB, 2 GB, 20x CD, Floppy drive, ethernet, 56K modem, 12.1 STN display, $1,349. PowerBook G3, 233 MHz, 32 MB, 2 GB, 20x CD, Floppy drive, ethernet, 14.1 TFT display, $1,799. PowerBook G3 233 MHz, 32 MB, 2 GB, 20x CD, No Floppy drive, ethernet, 56K modem, 14.1 TFT display, $1,899. PowerBook G3 266 MHz, 64 MB, 4 GB, 20x CD, No Floppy drive, ethernet, 56K modem, 14.1 TFT display, $2,299. 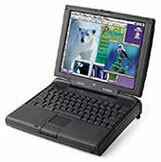 PowerBook G3 300 MHz, 64 MB, 8 GB, DVD, No Floppy drive, ethernet, 56K modem, 14.1 TFT display, $3,199. These machines all come with Apple's 90 day refurb. warranty. In my estimation, the Series I 233 MHz 'Book at $1,349 complete with floppy drive and 56k modem is an exceptional deal. One of the reasons for the low price is that this machine has two alleged deficiencies that are largely a matter of perception. First, it has a dual-scan (STN) passive-matrix display. STN screens tend to get sneered at by reviewers. That's unfortunate, because I've spent some time working on one of these machines and discovered that the viewing quality is in fact quite decent. I would even venture to say that for the kind of work I do most of the time, I in some ways prefer the warmer and "gentler" display quality of an STN display to the colder crispness of a TFT unit. Of course the TFT produces a higher quality image with a much faster redraw response (no cursor submarining), and if you do work that requires really sharp, high-definition imaging, the TFT is superior by a substantial margin. However, if your portable computing is mainly text-manipulation, number-crunching, email, and Web-surfing, then don't be scared away from STN displays. They are cheaper, and provide a very pleasant, friendly interface. IMHO anyway. The other supposed shortcoming of the Series I entry-level machines is the lack of a Level 2 cache. This PowerBook's MacBench processor score is 445, versus the Series II G3 'Book (which has a 512k L2 cache) at 764. However, for a bit of perspective, the PowerBook 3400/240, which was considered lightning-fast not too long ago, MacBenches at 337, so the cacheless G3 Series is no slouch. It's the old hot-rodders' equation: "Speed costs money; how fast do you want to go?" The Series I G3 'Book at $1,349 offers a lot of performance for the money. Having trouble telling the original G3 and the G3 Series 'Books apart? Apple has posted a TIL article on their Website, complete with pictures and graphs, telling us how to distinguish the original G3 250 PowerBook from the G3 Series machines. "Macintosh PowerBook G3 Series computers should not be confused with Macintosh PowerBook G3 computers. Though the names are similar, there are significant differences," Apple tells us. Uh, did you ever think that it might have been a good idea to think up different names for the two types? Apple appears to be trying to flog more mileage out of the overextended G3 name than Chrysler did by hanging the LeBaron nameplate on a whole passel of completely different models a few years back. "There are two different ways to identify the PowerBook G3 Series (M4753) over the previous model of PowerBook G3: by Family Number or by visual inspection," the article says helpfully. Who writes this stuff?! "There are two ways to visually identify whether the computer is a PowerBook G3 or a PowerBook G3 Series," the text babbles on. Now listen carefully, kiddies, you don't want to miss anything here. "Method 1 - Close the display and inspect the display case. A Macintosh PowerBook G3, released October 1997, has a small, six-color Apple logo close to the case latch. The PowerBook G3 resembles the older PowerBook 3400. A Macintosh PowerBook G3 Series (M4753) computer, released May 1998, has a large embedded white Apple logo near the middle of the top cover. "Method 2 - Notice that the older PowerBook G3 top case is of a similar style to the PowerBook 3400 Series. This makes it easy to recognize when comparing those units together." Got that? In case you didn't, Apple has thoughtfully supplied large color pictures to help you grasp the subtle distinction between a computer that looks like a swollen 5300 and the sleek and curvaceous G3 series. But Apple still isn't 100 percent sure you've got the concept straight. "The PowerBook G3 Series computer is slimmer - that is, it is not as thick as the older PowerBook G3 computer." Clear enough for you? The G3 Series is slimmer because it's not as thick as the older model. There are some graphs showing the various G3 PowerBook model configurations, but I even found an error there. In the section on the Series II "PDQ" machines introduced in September 1998, it says that there is no backside L2 cache on the 233 MHz version with 12.1" display. Wrong! I am typing this column on just such a machine, and, yes, it does have a 512k backside cache, thank you very much. It even said so on the box it came in. Of the three older PowerBook models listed above, the 180c is a particularly delicious value. The 180c was Apple's first "real" color PowerBook, and it was very expensive. Its dual backlights drain the battery unmercifully fast, and it only supports 14 MB RAM, but up to $400 is a fair price for one in good shape, and 277 is a steal. For complete info on the 180c, go here. If I didn't already have a good '030 machine (LC 520 desktop) for a backup Mac, I'd be tempted. Celebrating its 15th anniversary, Nisus Software Inc. has announced a freeware release of its lightning-fast and amazingly tiny word processing application, Nisus Compact, which boasts much of the power and feature-set of its big brother, Nisus Writer 5.1.3, in an application not much bigger than SimpleText. According to Nisus founder and CEO Jerzy Lewak, "We are giving away another software title from our high quality line of Macintosh products. Macintosh users can download Nisus Compact for free and get a taste of word processing at its best and most efficient. In these days of bloated software, Nisus Compact is a refreshing reminder of how powerful and useful a small application can be." At a mere 1.1 MB for the full download, Nisus Compact offers amazing power, and is an especially useful word processor for older Macs with smaller hard drives and limited RAM capacity such as the 100 series PowerBooks. FILES COMPATIBLE WITH NISUS WRITER - You can interchange fully formatted files between the two applications. FLUID GRAPHICS - Paste graphics as characters or on a separate graphic layer to move with text or fix to page position. FILE CLERK - Organize, categorize and retrieve all your files, from within your word processor. UNLIMITED UNDOES - Write with the freedom to undo all your mistakes, saved or not, all the way back to opening the document. WILD CARD FIND - Search and replace using wild cards. FUZZY FIND - Approximate, sound-alike matches are a search option. Nisus Compact runs happily on both 68k and PowerPC Macs, and it's speed and low memory requirements make it a natural for older machines as well as the latest ones. Nisus takes a bit of getting used to if you've cut your word processing teeth on Word, WordPerfect, or ClarisWorks, but it quickly grows on you. The free Nisus Compact for download, which requires an online registration, can be found on the Nisus Web page here. One of the coolest things about the joining Nisus community is the Nisus List, which Nisus Software personnel, including Jerzy Lewak, actually read and from time to time answer members' questions. Imagine Bill Gates communing with the Word lemmings on an email list! To subscribe, just send an email message to NISUS@LISTSERV.DARTMOUTH.EDU, with "subscribe Nisus" in the subject line. Psst: Wanna have the fastest laptop in the world (at least until Lombard ships)? The Vimage Corporation began shipping two new upgrades for the PowerBook 2400 this week. The upgrades are a silicon-based 240 MHz version with 512k of L2 backside cache, and an exciting copper-based 320 MHz version with 1 MB of L2 backside cache. Both cards ship with software that allows users to adjust the L2 cache speed ratio to optimize for longer battery life or maximum speed. Nearly quadrupling the CPU speed of the 2400/180, the 320 MHz card turns the 2400 into the fastest notebook computer in the entire Macintosh computing world. Despite its speed, the 320 MHz chip runs cool thanks to its use of IBM's LoneStar copper technology. Even after running all day, a 320 MHz-equipped PB 2400 remains pleasantly cool to the touch, Vimage claims. The 240 MHz card offers a powerful but more economical speed boost PowerBook 2400 owners. The 240 MHz G3 Vpower card delivers an improvement of 2.5 times the CPU speed over the 2400/180's stock 603e CPU. Because the 2400's cramped innards are not exactly user-friendly for owner-upgrading, Vimage strongly recommends that the new Vpower PB 2400 G3 upgrade cards be installed by trained and certified technicians. Suggested list prices are $649 for the 240 and $999 for the 320. The upgrades may be purchased from various resellers, or directly from the Vimage Store Website.